Getting married soon? 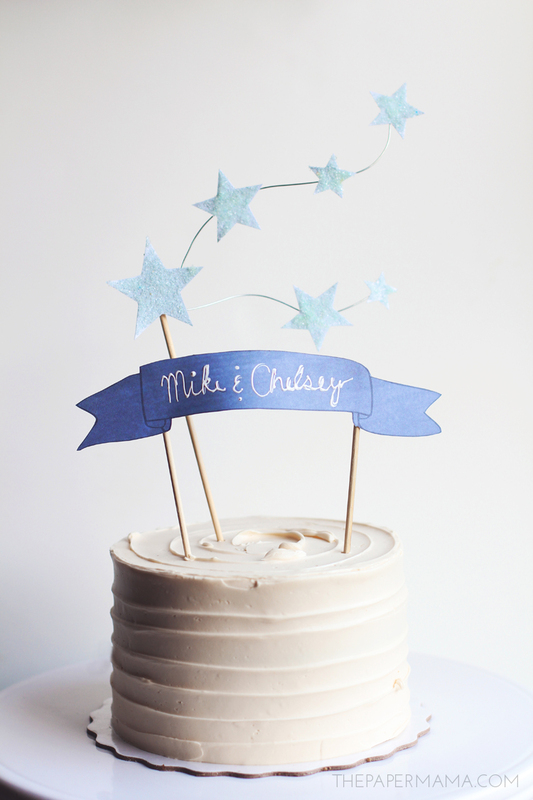 Well, I have a perfect little cake topper for you. 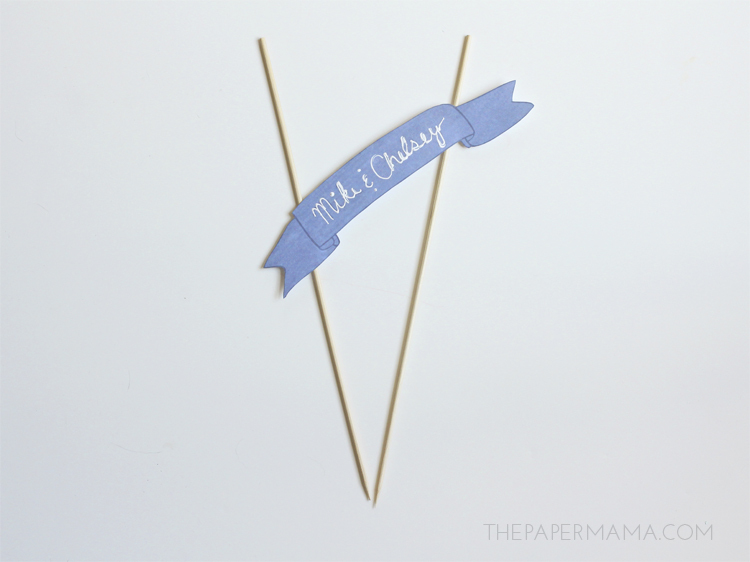 It’s adorable and inexpensive (plus, super easy to make). This summer I’ll be celebrating my 6th wedding anniversary, but I can still remember the rush/stress/craziness of planning a wedding. 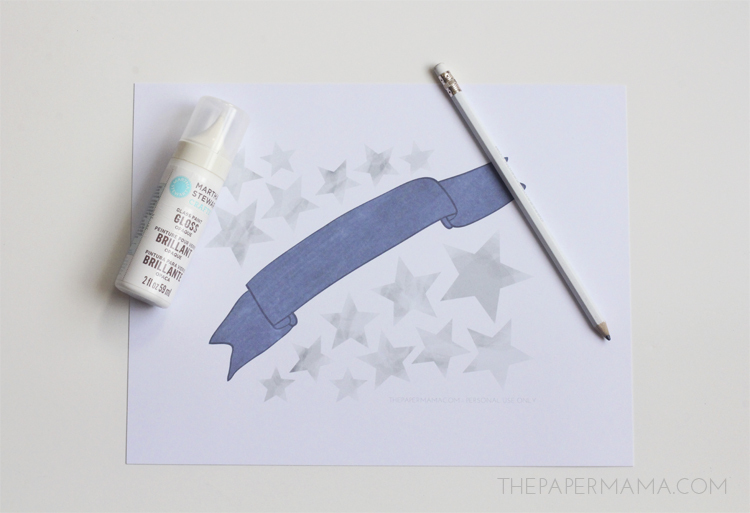 Maybe this little free printable will help make your day a little less crazy? I hope so. If you’re not planning a wedding, no worries: this topper would also be an adorable birthday cake topper, OR a very cute baby shower cake topper. Really, you can use it for any celebration. 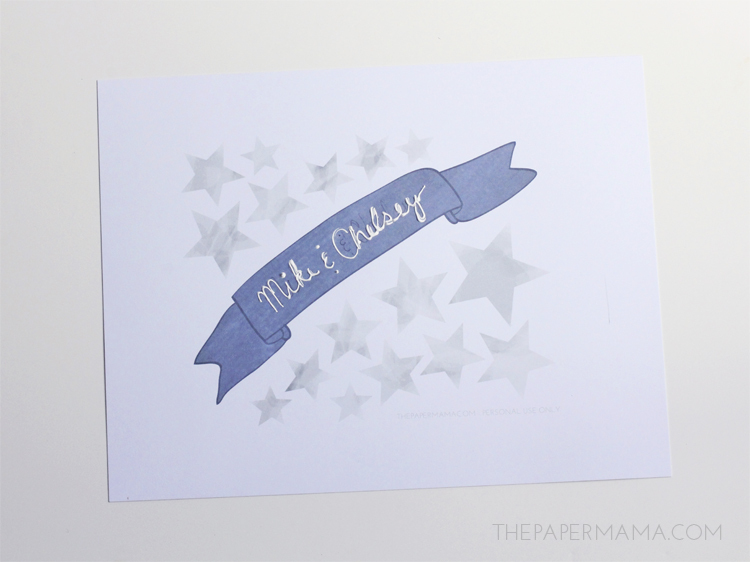 STEP 1: Print out the banner and stars printable. If you have a larger cake, keep the print scale around 100%. My cake was small, so I scaled down the print size to 70%. 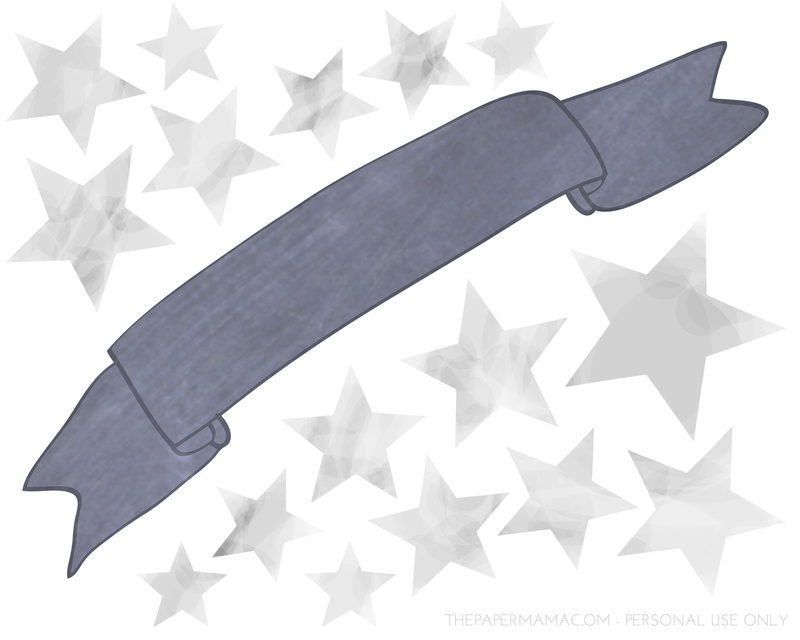 STEP 2: Use your pencil to draw out the names on the banner. Grab the paint. The reason I recommended the Martha Stewart Glass Paint is because the top of the bottle has a point, perfect for tracing the names you just drew with the pencil. Let the paint dry completely. Tip #1: want to skip the whole handwriting the name on the banner? Well, if you have photoshop you can download the print I provided and type out the names in white (placing the font over the banner). Save and print. STEP 3: When the paint is dry, use scissors to carefully cut out the banner. 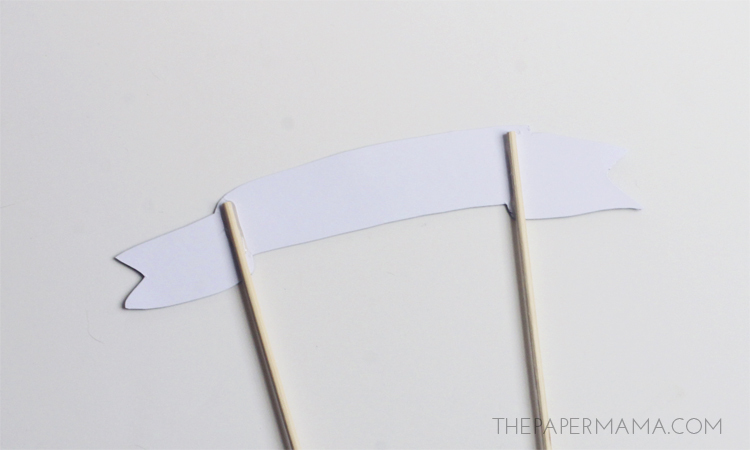 Then, use the hot glue to attach the back of the banner to the tops of two skewers (see photo above). 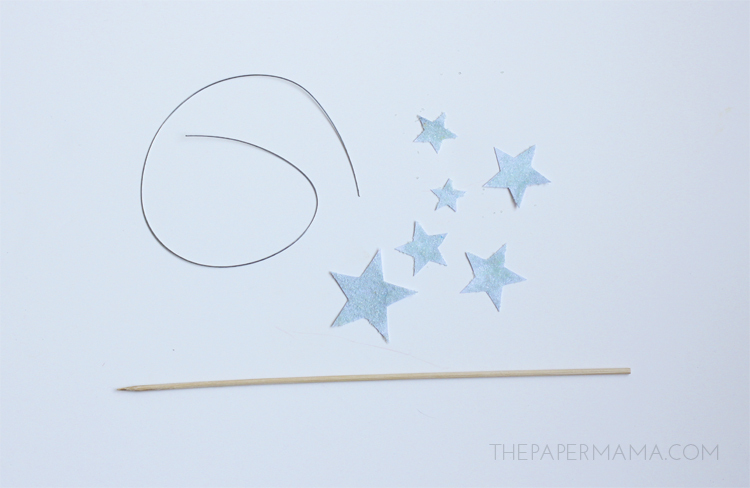 STEP 4: Let’s make those stars sparkle! I didn’t want to use glitter for this step, because if it fell on the cake (seriously, glitter gets EVERYWHERE) then it may be eaten. So, I found these pretty colorful cake sprinkles to use in place of glitter (no harm eating these cake sprinkles). 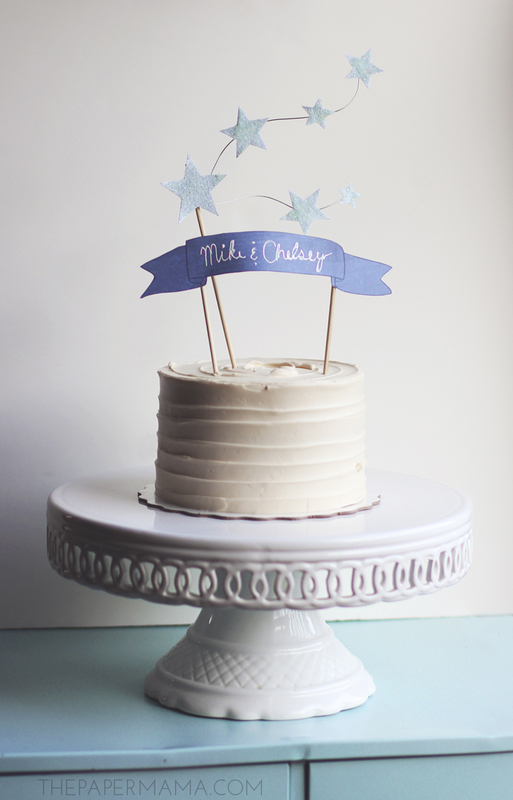 Use an old paintbrush to brush a coating of Mod Podge on the star, then sprinkle on a coating of the cake sprinkles. Let dry completely. 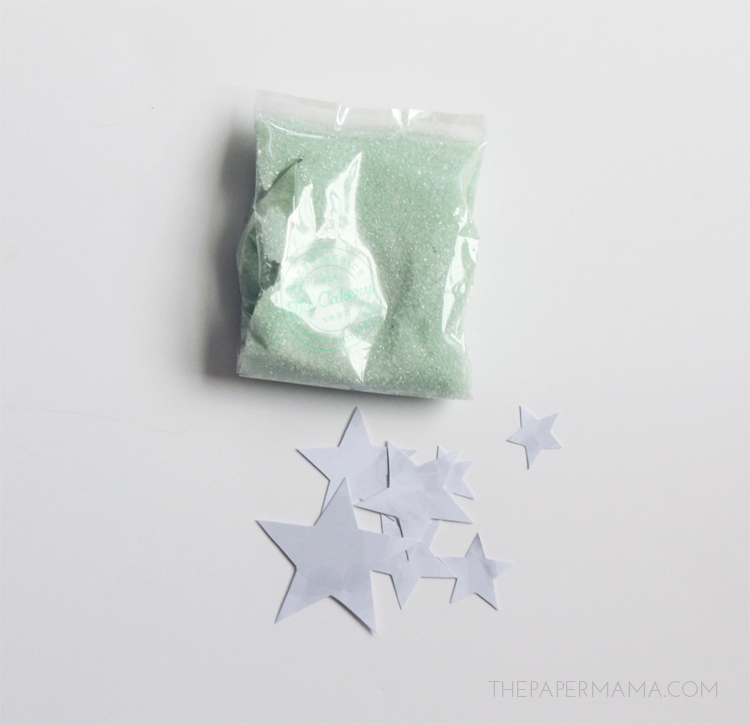 Tip #2: Sometimes it’s hard to get the Mod Podge smooth, so I use my finger to smooth it out on the stars before I put on the sprinkles. STEP 5: Cut out 2 pieces of wire (the length is up to you, but I started with 12 inches and trimmed down). Wrap the end of both wire near the top of the skewer. 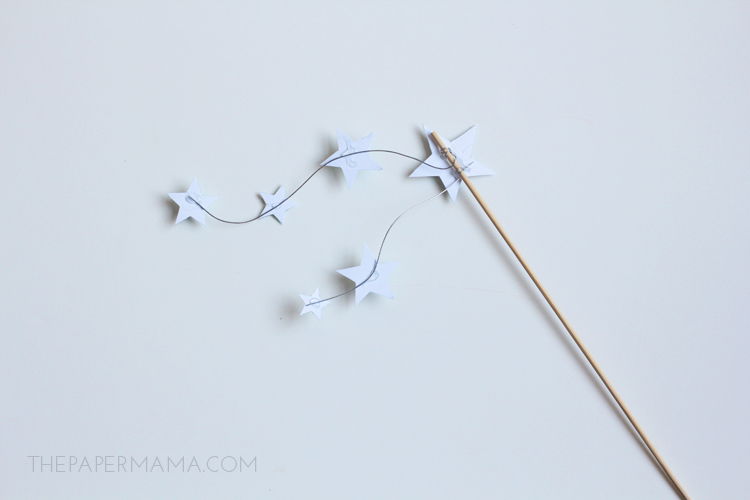 Hot glue the back of one larger star over the wrapped wire to cover it up (see photo above). 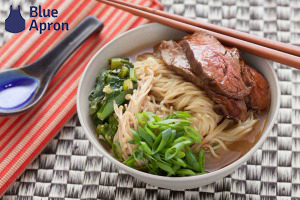 Use your hands to curve the wire a bit (see image above). 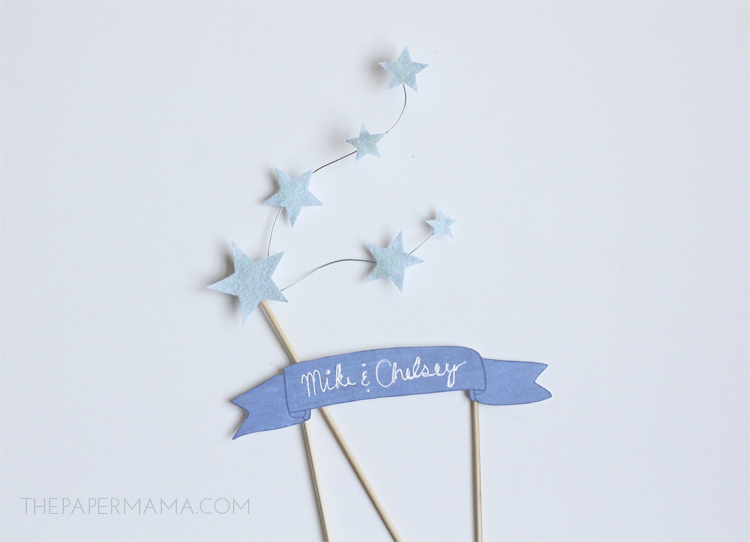 Space out some stars and hot glue them along the wires. Trim any excess wire. STEP 6: If needed, trim the length of your skewers. Since I had a tiny cake, I trimmed off about 4 inches from each wooden skewer with my wire cutter. 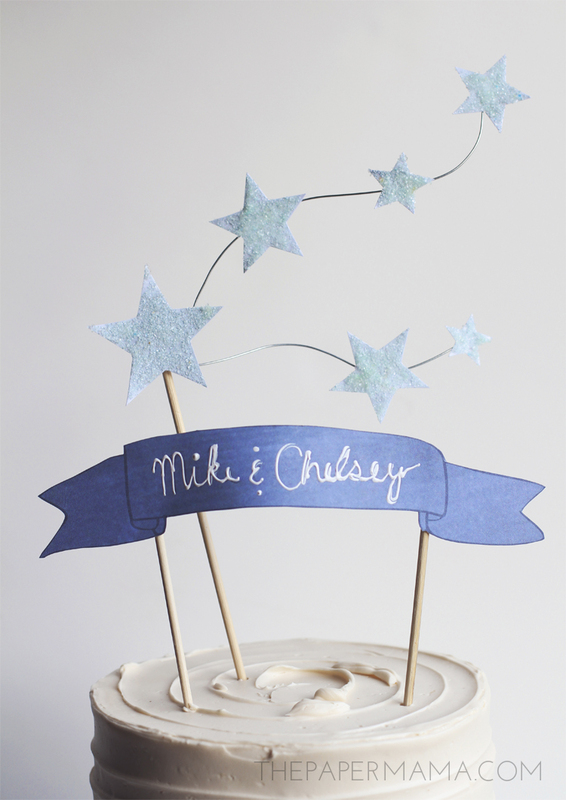 STEP 7: Choose a spot for your banner and stars to go on the cake. I put my banner in front and put the stars about 2 inches behind the banner. Carefully push the skewers into the top of the cake. You are done! I am a paid contributor for the HP Create website. All opinions are my own. I picked up this beautiful cake from a local Portland bakery, The Cakery. Highly recommended if you’re in the area and don’t feel like baking a cake. Great idea to make celebration as low cost. 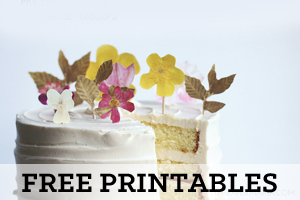 I love idea for making printable cake. Next month my sister marriage anniversary, so I will suggest this idea for making anniversary cake. Such a cute idea, Chelsey. 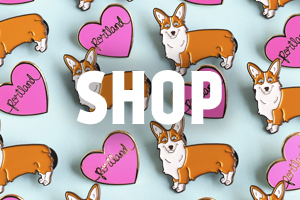 Love your new layout, by the way.